Is Frontline Flea and Tick Treatment Safe To Use on Dogs? Is Frontline Plus Safe To Use on Dogs? Frontline Plus – a drug invented by Merial is in question about its safety as there have been reports which reveal that the usage in dogs has caused several side-effects like itching, hair loss, sleep disorder, changes in gait, lethargy, and vomiting. Honestly, every drug has its side-effects and it is clearly mentioned on the label of the product. However, these are supposedly mild or rare which doesn’t affect a healthy pet. There are factors that relate the effectiveness of the product and its adverse reactions to its usage and the conditions in which it is applied. Let’s have a look at all the aspect that decides the safety of a drug. Every drug, be it Frontline Plus or any other treatment for that matter, must be used only as per the directions mentioned in the pack insert. If the insert mentions that a topical treatment must be applied between the shoulder blades then it should be applied exactly at the same spot. Applying it elsewhere would increase the chances of a dog licking the treatment and thus bearing the side-effects. The product which is invented for external use mustn’t be ingested anyhow. When all the directions are followed appropriately, the dose will work as claimed. If The Dose Is Correct For The Body Weight? Body weight plays an important role when it comes to the safety of the product. For instance, if you use a product that is formulated for adult dogs, it certainly will react on a pup because the concentration of ingredients is high as compared to the one designed for young dogs. It may pose a high risk to health in such cases. The Dog Or Cat Isn’t Allergic To The Ingredients? Although dogs and cats are usually not allergic to fipronil or s-methoprene in Frontline Plus, exceptions may always be there. You can ensure that just after the first use itself. If a pet shows convulsions, stop the treatment immediately and consult the vet. Better switch to other product. Pet’s Immunity Is Not Compromised? Every drug that is invented is formulated for healthy pets with good immunity, if not strong. If the pet already has a sensitive immune system, any product can show adverse effects due to intolerance. Whether The Pet Is On Any Other Treatment Or Not? Sometimes if the pet is already taking treatment for some other disease and you apply frontline plus, chances are that the two treatments may react with each other adversely. This leads to failure of a treatment and would rather prove fatal. Therefore, do not administer two treatments together unless your vet has advised to do so. In case of Frontline Plus, all these factors come into play which decides if the drug is safe or not. If we go by the manufacturer’s message – Frontline Plus is mild and work within 24 hours to combat fleas and ticks. It is safe to use with the directions mentioned on the label. Fipronil and s-methoprene present in Frontline Plus traverses into the bloodstream through the skin of an animal. When the insect bites the animal while taking the blood meal, the ingredients present in the pet’s blood get transferred to the insect. As they enter a flea’s body, the nervous system (CNS) of the insect is disrupted thereby killing the parasite. And also prevents them from reproducing further. Although the chemical does travel into the pet’s bloodstream, it doesn’t really cause any harm to the GABA receptor in mammals. Fipronil only acts intensely on GABA receptor of insects and on the GluCl receptors which are absent in mammals. Thus, Frontline Plus doesn’t cause any harm to the pet’s body. Moreover, the concentration of the ingredients is so adjusted that it doesn’t produce any toxic effect in healthy pets. In case of humans, it is recommended that children must be kept out of reach because if the product is transferred to the kid’s skin, it may traverse into the skin tissues. Although it still won’t cause much harm as the concentration picked up would be too low, it is better to stay safe. So unless ingested directly, there won’t be any safety issues related to Frontline Plus even in humans, keeping the exceptions apart. 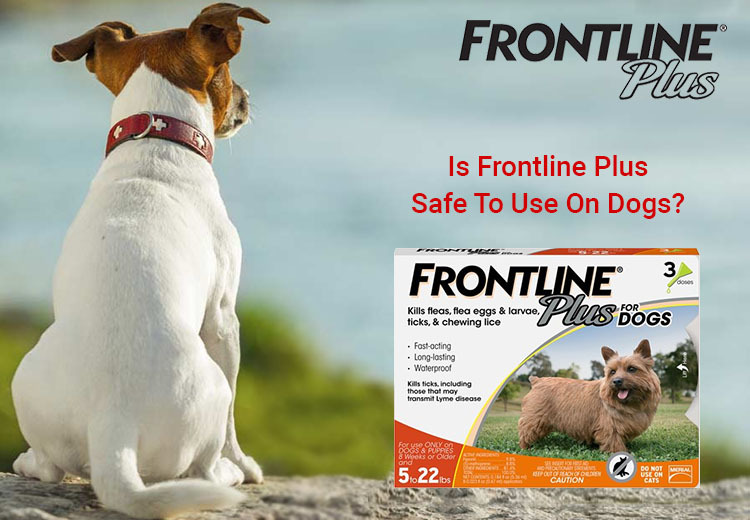 Frontline Plus is completely safe to use in pets when used appropriately according to the mentioned directions on the label.